Yorkshire Loft Boarding cater for the huge demand for extra home storage. They install to very high standards, specifications and follow building regulations to allow your loft to have extra storage by using your loft and to keep its insulation level high as intended so your home will remain as energy efficient as possible. At Yorkshire loft boarding we specialise in installing the only BBA approved loft boarding system in the UK - The LoftZone StoreFloor. Enables compliance with Part L, Part K, CDM and Working At Height industry regulations. This system has won many awards over the years including winning ideal inventor at the Ideal Home Show. 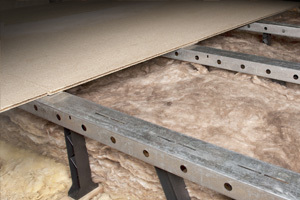 The LoftZone raised loft floor is a lightweight, low cost, quick to have installed and provides a very strong platform for storing items and walking on, while protecting the 270mm loft insulation and allowing it to save energy and cut fuel bills as intended. The LoftZone StoreFloor is a lightweight, low cost, easy-to-install and very strong platform for storing items and walking on, while protecting the 270mm loft insulation and allowing it to save energy and cut fuel bills as intended. StoreFloor protects the insulation underneath it, and provides a strong floor for safe access or storage. The only way to use a loft with the full 270mm of insulation for storage is to install a raised loft floor above the insulation. This is a low cost but essential addition if you want to store items in your loft and get the full benefit of your insulation. The LoftZone StoreFloor is the only system to do this which is cheap, easy to install and safe. 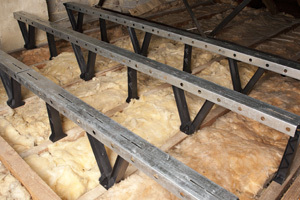 The cheapest and simplest solution to the very common problem of storing items in a fully-insulated loft is to install a raised floor above the insulation. The LoftZone StoreFloor is a lightweight, low cost, easy-to-install and very strong platform for storing items and walking on, while protecting the 270mm loft insulation and allowing it to save energy and cut fuel bills as intended. 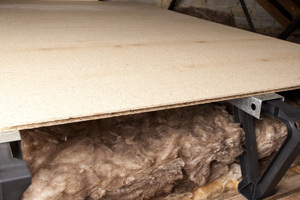 The combined cost of insulation, the LoftZone StoreFloor and loft floor boards is still cheaper than the only other safe solution which is to lay rigid foam insulation on the loft floor and board above that. There is also no need to spend time cutting the foam to size nor worry about leaving air gaps. Other products to raise the height of the loft floor don't work as well because loft joists are not evenly spaced, which means it can be difficult to secure the loft boards firmly on to them. Only StoreFloor has an adjustable beam which means that you can safely screw the boards down on to them, regardless of joist spacing. The beam also allows you to bridge over any obstructions in the loft too. So how does it all go together? Watch the video for an animated example of how the store floor system is put together. Acknowledgement to LoftZone for any images, video or text used on this website.